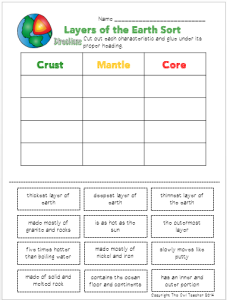 Home » GRADE LEVELS » 2nd Grade » FREE SCIENCE LESSON – Layers of the Earth! An earth science unit would never be complete without first discussing the three layers of the earth! Most students know a thing or two about these layers. They know the center is the core and it’s hot! They know the crust is where the land is. But why not see just how much they know? If you head over to this page on my blog (found here) you will find this cute cut and paste freebie for your students! They read each strip, then cut it out, and glue it under the correct column! How fun is that? Isn’t it nice to have a different activity related to the layers of the earth that is FREE!? !